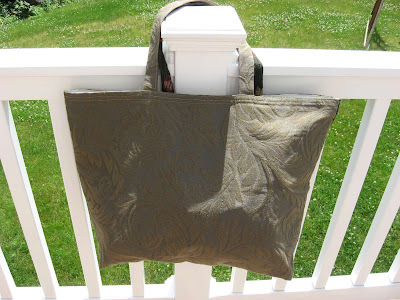 Hooked on Needles: Reduce, Reuse, Recycle - More Tote Bags! Happy first day of summer! It's 87 degrees Fahrenheit, a little humid and very sunny here today so it's feeling like summer too! My husband has been enjoying watching all the World Cup soccer games while he is recuperating from his recent ordeal, which means I've been able to escape the heat and spend time in my nice cool sewing room in the basement. I have finally completed the first project I set out to do after my recent clean out and just before he went into the hospital and everything was put on hold. Feels good to be sewing again, and to have my husband well on his way to being healthy once again! In my cleaning out process, I discovered 10 upholstery samples remaining from a huge pile I had received many years ago from a friend who worked at a local furniture store. I used all the others to make dozens of tote bags and pillows of all sizes. THIS is the one I had made for myself which I love and use anytime I travel. But these last 10 have been sitting in the bottom of a bin just waiting to finally be made into something useful. I couldn't ignore them any longer. 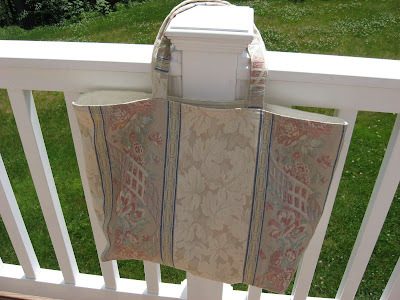 I paired them up and made a large, sturdy, lined tote bag out of each pair of high end upholstery samples. The lining is made out of sturdy drapery lining fabric from an old pair of draperies I remade into valances and matching pillows for a friend. 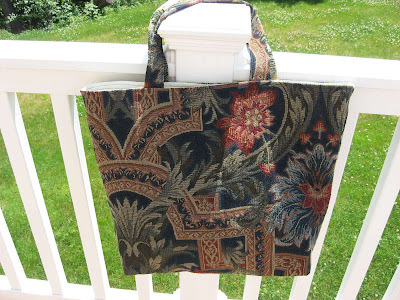 Yards and yards of such good fabric just had to be saved and put to good use! So these bags are all made from fabric that would otherwise have been thrown out. What a shame that would have been! 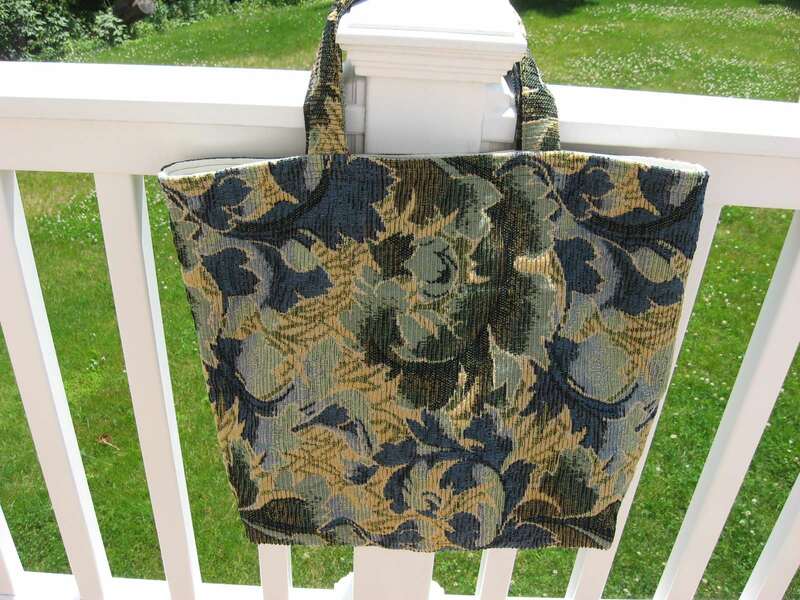 Here's side one of the first bag I'm calling Blue Floral. The bag measures 13 1/2 inches wide along the bottom seam and 14 inches tall along the side seams. The bottom is boxed and measures 6 inches deep. This is the other side of Blue Floral. 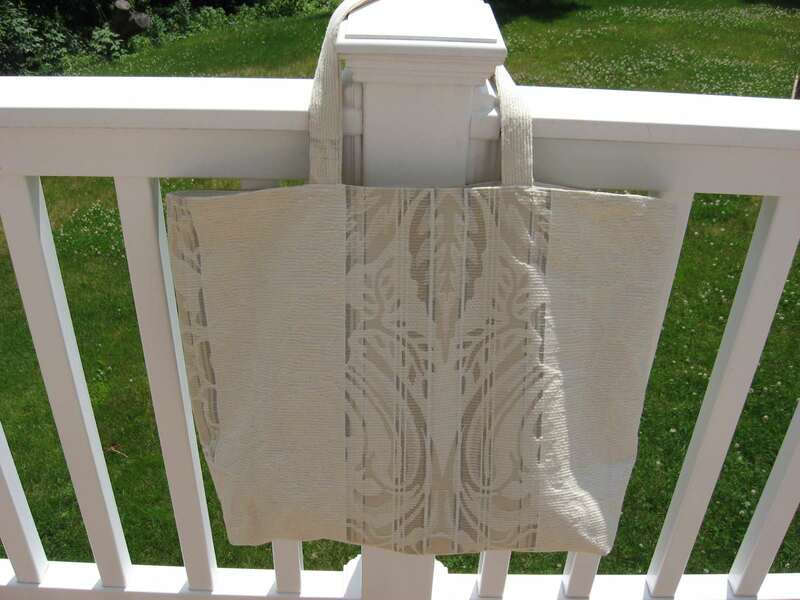 Here's side one of the second bag which I'm calling Cream Stripes. This bag measures 16 inches wide along the bottom seam and 14 1/2 inches tall along the side seams. The bottom is boxed and measures 6 inches deep. And this is the other side of Cream Stripes. 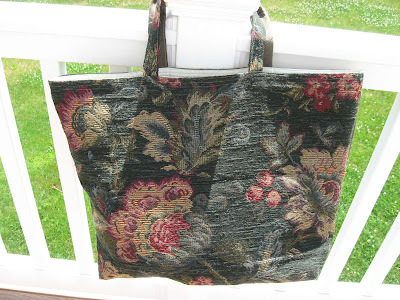 Here's side one of the third bag which I'm calling Dark Flowers. 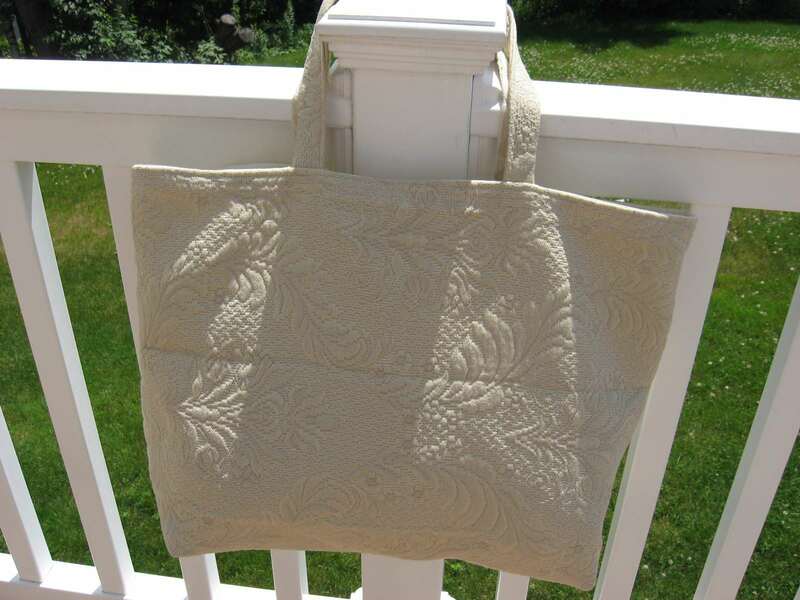 This bag measures 16 inches wide along the bottom seam and 14 1/2 inches tall along the side seams. The bottom is boxed and measures 6 inches deep. This is the other side of Dark Flowers. And this is side one of the fourth bag which I'm calling White Swirlies. This bag measures 15 1/2 inches wide along the bottom seam and 14 inches tall along the side seams. The bottom is boxed and measures 6 inches deep. And this is the other side of White Swirlies. 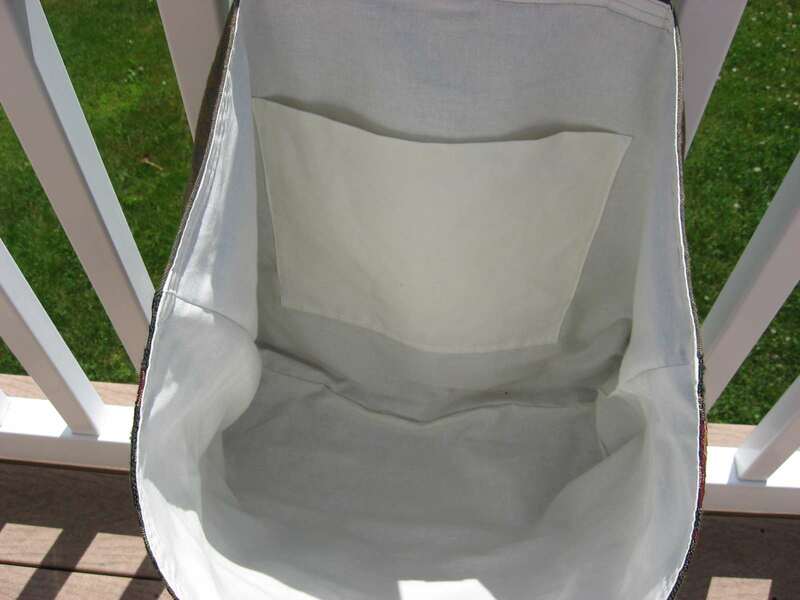 All four bags have the same drapery lining fabric on the inside and each one has a pocket on one side just like you see here. 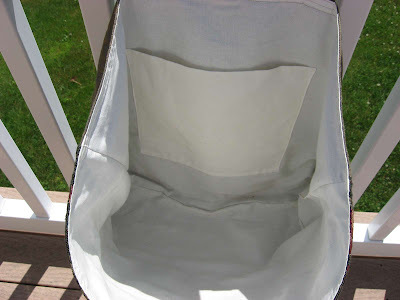 The top edge is triple stitched for added strength and to hold the handles in place. Just imagine how much project stuff you could pack into one of these bags to take along on your next trip! These bags will be up on my Etsy shop shortly, selling for $15 each plus shipping. Are you wondering what happened to the other two upholstery samples I rescued from the bottom of the bin? There were 10, remember? Well, I made those into a tote bag too, just like the four you see here. Then my friend Jane, whom you have met before, came for a visit. I think she's becoming as much of a bag lady as I am! So, you guessed it, Jane has a new tote bag! Those are very nice looking bags. 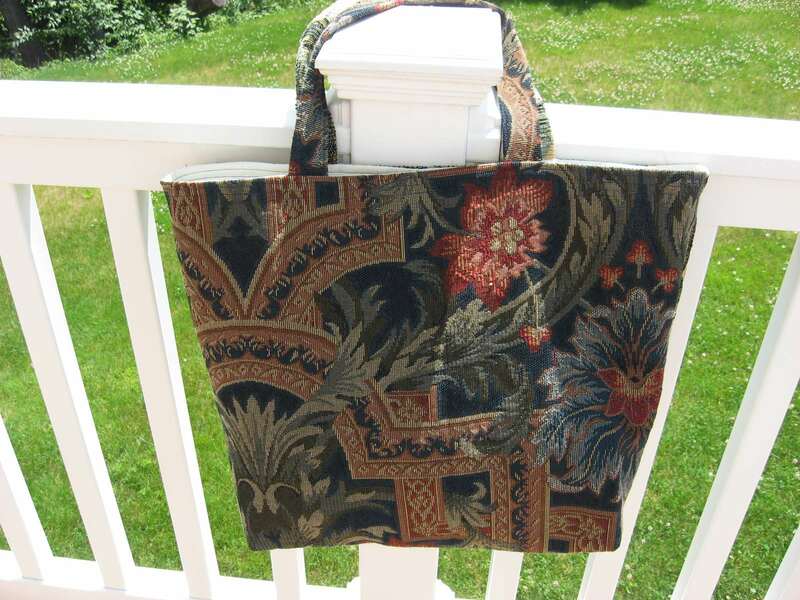 My mother used to collect fabric from the lazy-boy factory and make bags and such. I still have a few. So glad your husband is doing better. 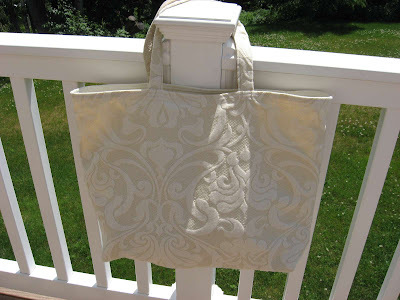 sUCH BEAUTIFUL BAGS mARY gRACE.jUST LOVELY. Those are gorgeous bags! Reminds me that I have a bag full of upholstery samples to play with some time. I'm glad to hear hubby is on the mend. I am so glad you hubby is on the road to recovery! Love the bags what a great use for the fabric, wow, were you ever busy!! 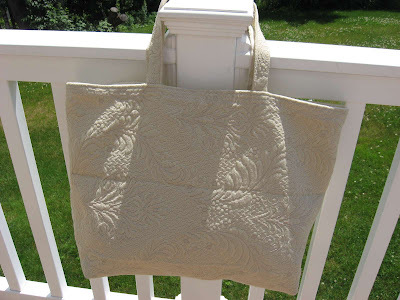 I do have a wonderful, sturdy tote bag, thanks to my friend! I'm so glad I picked a nice brown toned one, so I can take it to all those softball tourneys. You'd be surprised at how much you can fit in it. Thank you for the bag, for the visit and for the ice and water!